I found this interesting article from digitalartsonline about finding an illustration agent. It comes at a time where I am living day to day, waiting for that moment where I go it alone. It's a total bloody minefield trying to work out how to actually do this. You spend a lot of time wondering when the right time to "go for it" is going to reveal itself to you. Reading that piece about getting an agent made me wonder if I even want one. Would I actually need one? I should probably get one when I start this shouldn't I? I'm telling myself that I probably need some sort of fall back, something that helps me make the best possible start. The reality is that I don't know where the safety net needs to be. I don't think anyone knows what the moment will be like, when we step out into space beyond our comfortable day to day lives. The fear is strong, particularly when making these big career/life decisions. Admittedly I have been here before, I had an agent when I was Djing. I actually think this made me lazy, I didn't chase things up as much, I relied on someone else. My thoughts are that this isn't necessary, you should ultimately be responsible for driving yourself on, you have to do the work. The DigitalArts article does offer some excellent advice about whether you do need an agent or not. It discusses the various reasons you might want an agent, be it to promote your work and get you jobs, or take care of the admin and business side of things. This is just one of the many things an artist/creative thinks about when they want to break out as a professional. 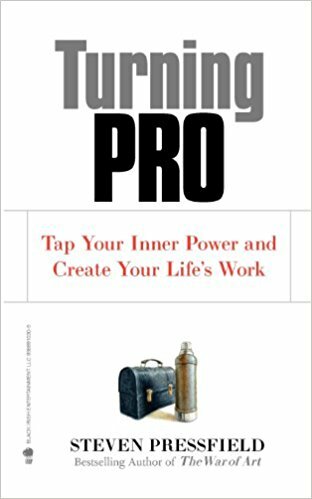 I am currently reading a great book called "Turning Pro" by Steven Pressfield. The premise of the book is that there are two types of people, amateurs and professionals. The main obstacle to becoming a professional or "turning pro" is what Pressfield calls "resistance". Resistance comes in many forms. Love, procrastination, distraction, alcohol - A lot of "fun" stuff basically. We can become addicted to resistance, not necessarily because it's fun, but because it can offer us a safe alternative to a hard, professional life. Turning pro is hard. Being an amateur is easy. Living the pro-life isn't for everyone (as the book states) but for artists and entrepreneurs, it's completely necessary in order to feel fulfilled. The more I read it the more profound the effect is on me. I keep having these moments of clarity, relating completely to what the writer has been through. Steven Pressfield reveals that he went pro when he turned 31. I have some previous experience of turning pro but in truth, I wasn't really in the right place when I was Djing. I was an addict, an addict to all of the various distractions that come with the DJ profession. I loved it and I still love music but I also knew that it wasn't the right life for me. It never felt like it would be on my terms, even when I was working hard I couldn't pull down the self-imposed barriers. It always felt like I was an impostor, an amateur looking for some recognition, seeking approval for things instead of believing in what I could do. I pulled the pin as Pressfield describes it. Pulling the pin is what many of us do when the going gets tough, or when we aren't satisfied with our current path. To truly go pro you have to learn to roll with the punches and commit to not pulling the pin. You have to follow things through. Realising that things are actually quite hard and might not feel "natural" has taken me some time to realise. It may sound like a ridiculous notion but for years I thought that if I could just do something and it didn't make me want to smash my head against a wall, that was the thing I should do. It's still the hardest thing to overcome. I really need to spend time improving my understanding of human anatomy... But let's draw an Easter Island head instead. I also made the classic mistake of looking at my heroes and peers who were doing great things, thinking that they were just born great. A part of me (granted still a big part of me) looks at an artists integrity and thinks of them as these "complete artists". These people never sold out. They never had to because they always knew what they were doing. They always stuck to the same road, the road we see. The end product was what the artist always had in mind, they never made any mistakes. Understanding that what we see as a consumer is just the surface, is an important part of the journey to actually making it work as an artist. The surface does not tell the whole story. Most of the time we aren't let into the process, although you could argue that social media is now letting us into that previously hidden world. Your favourite album might be comprised of 10 songs but there are another 50 others we haven't heard that were not quite good enough. I look at a musician, an illustrator, a painter, a comedian, any craftsman or woman, and attempt to understand years of blood, sweat and tears that went into that moment in time. Think about the violinist spending all of her time practising. She probably missed out on time with friends, sacrificed relationships, nights out and lived off baked beans for months on end. Think about the financial sacrifices, the arguments with her parents, all for her art. When she stands on the stage and performs, that is her life's work, her time spent torturing herself and going through agony for her art. Going it alone, turning pro, whatever you want to call it takes a lot. I think you get to a point in your life where you truly understand what it takes. Deep down you feel ready for it, even if it scares you. Some are lucky, they understand what it takes from a young age. We call those people, Prince. Me, I'm still learning, but I feel like even just typing these words out, keeping a record of my intention for all to see makes me less likely to fall into bad habits. Commitment, perseverance and embracing the fear will lead to... Well, we shall see.